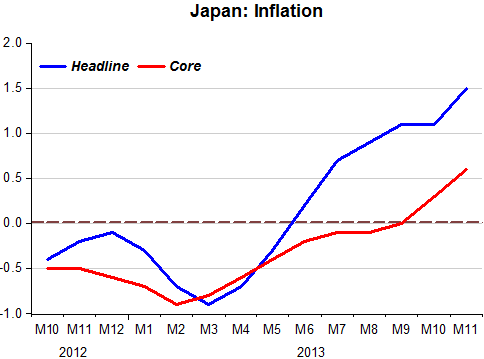 Shinzo Abe was elected in December 2012 on a promise to revive growth and put an end to deflation. How have his promises ‘performed’ one year after taking power? The ‘performance’ will be illustrated by a set of charts. The first chart shows the behavior of inflation, both headline and core. It appears to be gaining ‘positive traction’ after years of languishing in deflationary territory. 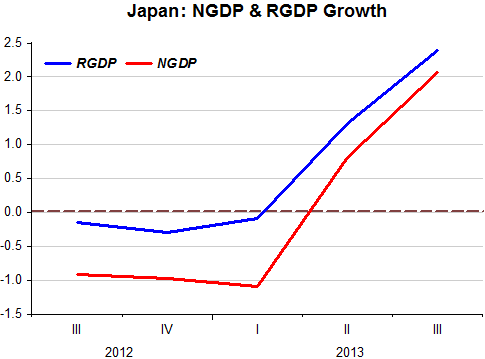 The next chart shows the bounce in aggregate demand (NGDP) and real output (RGDP). The next chart depicts what happened with the Nikkei stock index and the exchange rate (yen/USD). The strong rise in the stock market is indicative of positive expectations about the effects of the plan. The depreciation of the yen is an important transmission mechanism of the expansionary monetary policy. In this case, the initial negative reaction of competitors, who accused Japan of engaging in ‘beggar-thy-neighbor’ policies, was misplaced. 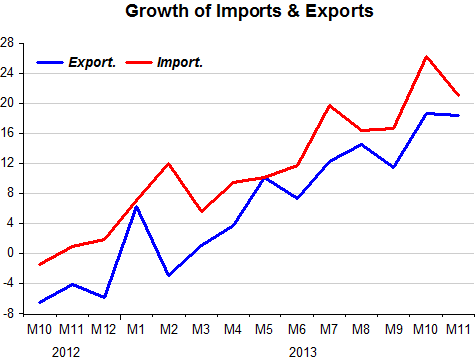 As the next chart shows, imports rose by more than exports, with Japan incurring a trade balance deficit. This is indicative that the income effect of the expansionary policy was stronger than the terms of trade effect of the exchange devaluation. In other words, it reflects an increase in domestic demand. 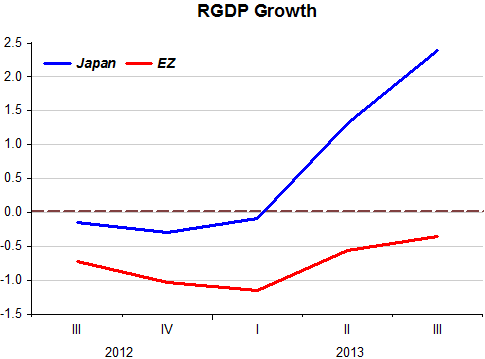 It is also interesting to compare Japan since ‘Abenomics’ with what´s happening in the Eurozone. 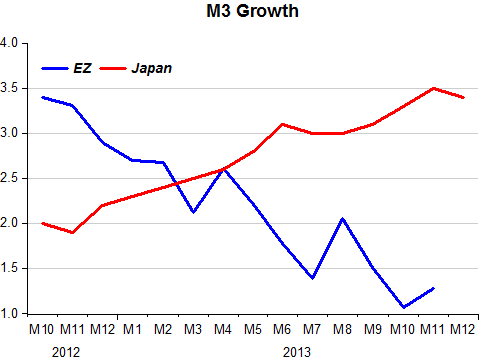 The chart shows the growth of broad money (M3). While in Japan, according to the plan, monetary policy is expansionary; in the Eurozone the BCE is tightening monetary policy. It is, therefore, not surprising to observe the contrasting behavior of inflation in the two cases. While in Japan inflation is climbing towards the 2% target, in the EZ it is way below target and falling, with several countries in the group experiencing deflation. The difference in the behavior of the BoJ and BCE is summarized in the chart below which shows the growth of real output in the two ‘countries’. 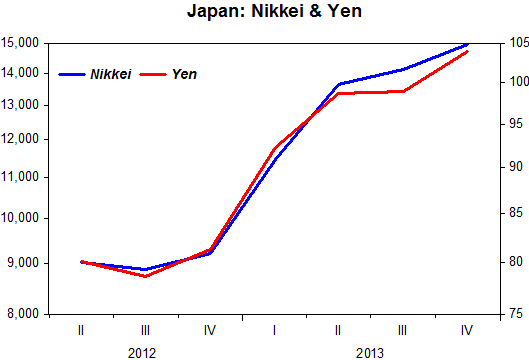 So it seems that ‘Abenomics’ is delivering on its promise. Hopefully it will continue to do so. 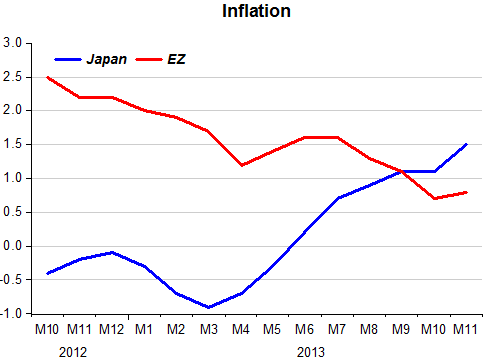 We may also conclude that the EZ is travelling to “where Japan is coming from”! Warren Buffett and his investment partner Charlie Munger explain their investing approach as constrained by “four filters”. 1) Invest in what you understand, 2) in businesses w/ durable competitive advantages, 3) w/ honest managers, 4) at a reasonable price. “It’s a very simple set of ideas. The reason that these ideas have not spread faster [particularly in academia] is they’re too simple.”, Munger says. Sumner gave a similarly bare-boned MM model awhile back: Increased M > Increased NGDP (hot potato) > Increased RGDP (musical chairs) > Asset market wealth effects feeds back into NGDP, and that’s it. That’s precisely what’s happened in Japan, as your charts show. You guys should invent some wacky new terminology, post-modernist style, and inject some meaningless math into the thing so that your colleagues can feel more impressive explaining this thing, and so that they don’t realize that you’re retiring their field of research. Again, excellent blogging. Let’s hope the BoJ does not get cold feet. I have a hunch they will have to persist for many years. Getting out of ZLB-deflation-recession may take some serious QE. Where did you get Japanese goods and services trade figures at a monthly frequency?